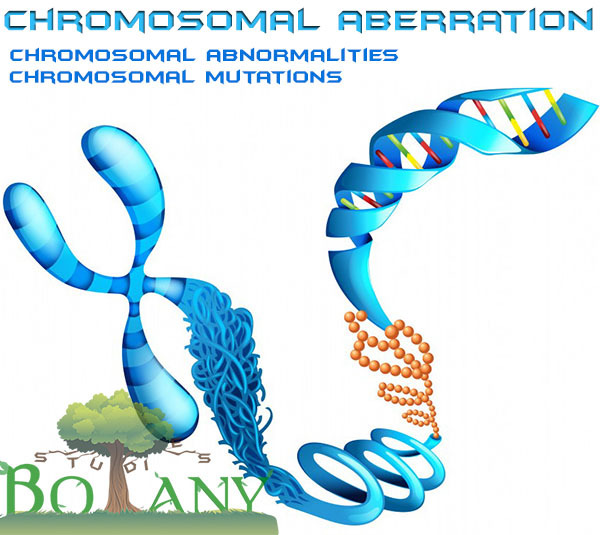 Chromosomal abnormalities or chromosomal aberration are two terms used when there is variation or change in number of chromosomes or in arrangement of genes. Genetic variations are indispensable to the process of evolution and to the individual identity of members of any species. Alleles are one source of such variations. The alleles arise as a result of mutations and result in alternative forms of a gene. The shuffling of genetic material during gamete formation through recombination’s, independent assortment and crossing over also bring genetic variations. Rearrangement of the genetic material either within or between chromosomes. Well, again all these changes can be referred as Chromosome Mutations, Chromosomal Abberrations or Chromosomal abnormalities. These are thought as mutations as the individuals produced as a result of these changes show distinct phenotypic, appearance, but the most modern term Aberration distinguish the changes in number of chromosomes or arrangement of genes as mentioned in first section. The individuals containing a chromosome aberration are usually abnormal but in many cases the changes do not affect the function of the individual, especially in cases where the aberrations involve rearrangement of a chromosome segment but not the gain or, loss of genetic material. The presence of additional genetic material to a diploid genome in plants may be tolerated but not in animals usually. 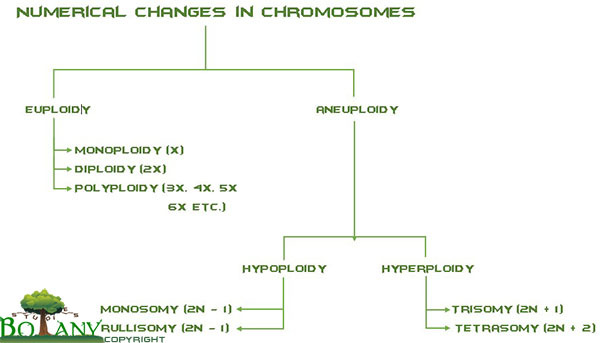 Variations in chromosome number involve addition or loss of one or more chromosomes or addition or loss of one or more haploid sets of chromosomes. 1: Aneuaploidy (Greek, aneu = uneven; ploids = units): When an organisms gains or loses one or more chromosomes, but not a complete set. This condition is termed as aneuploidy. 2: Euploidy (Greek, eu = even or true; ploids = units): When or more complete haploid sets of chromosomes are involved in the aberration, the condition is called euploidy. The individuals with one set of chromosomes are known as Monoploids; those with two sets of chromosomes are termed as Diploids; while when more than two sets of chromosomes are found, the organism is said to be a Polyploid.